Spanische Krapfen. Photo by the author. 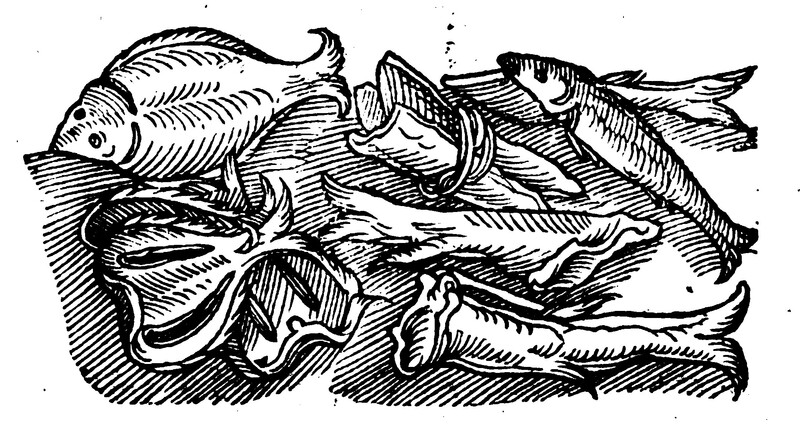 In the later middle ages, stockfish was one of the most valued goods of the North, and one of the most important reasons for German merchants to trade with the islands in the North Atlantic. Stockfish is dried cod or another species of fish from the gadidae family. After drying, which can only take place in polar regions, the fish becomes hard as a stick, hence the name (from German/Dutch “stock”: stick). A man hammering stockfish, detail from Pieter Bruegel the Elder’s Thin Kitchen (1596). Photo: Rijksmuseum Amsterdam. In this dried form, the fish can be preserved for many years, an important feature in a time when canned food, refrigerators or freezers were not invented yet. Therefore the stockfish was in high demand, although its preparation was very time- and labour-consuming. First of all, the dried stockfish needed to be hammered for a while to soften the flesh, and subsequently soaked in water for one or two days. Moreover, the taste was not considered to be very special to some. Marx Rumpolt, the cook of the prince elector of Mainz, remarked that “although many dishes can be made with it, it is just a stockfish, and it remains a stockfish […] and it is not worth the effort”. 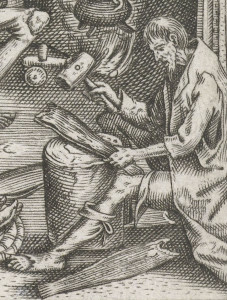 Nevertheless, Rumpolt listed twelve recipes for stockfish in his 1581 cookbook, Ein new kochbuch. 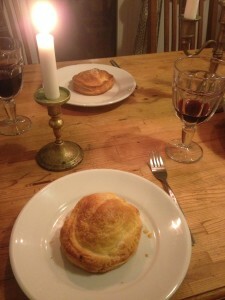 We decided to try one out and share the results here: Spanische Krapfen (Spanish puff pastry). It is a sweet pastry filled with stockfish sauce and raisins. The combination of sweet and hearty was quite common for upper-class cuisine of the late medieval and early modern time, but to modern taste it might seem a bit peculiar. Opinions within the team were divided: some rather liked the result, others found it too strange to really enjoy the meal. However, the fishy taste is almost absent, and it is certainly worth a try. Note: pre-modern recipes do not contain precise indications for amounts, temperatures, or cooking times. Moreover, in Rumpolt’s time pre-made puff pastry was not available, so he had to make it himself. As the cook of our team, I was too lazy to do that. 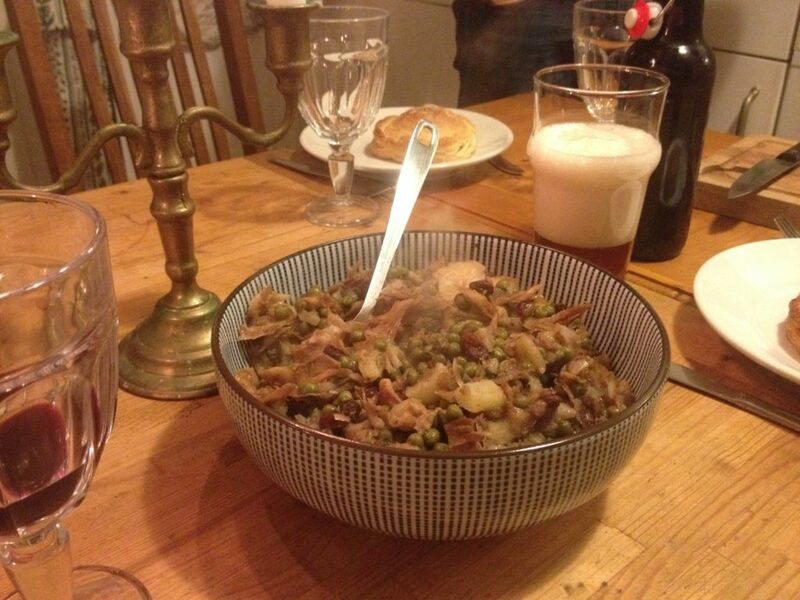 The following is therefore my own interpretation of Rumpolt’s recipe. For the more adventurous (or historically correct) cooks, the original recipe can be found here (page CXXXIII, recipe 5-6). Stockfish and other dried fish. Illustration from Rumpolt’s cook book. Image: Google books. Pre-heat the oven at 180°C. When using deep frozen puff pastry, take it out of the freezer and let it defreeze. Cook the fish well for 20 minutes, until it starts falling apart. Let it drip out in a sieve, press out as much water as possible. Cut the fish into tiny pieces. Make a roux by melting the butter in a pan. Add the flour. Let it cook until all flour is absorbed and starts to colour. Then add the milk in parts and let it cook for a couple of minutes. The result should be a thick sauce. Stir in the raisins and fish. Add sugar to taste. Roll out the puff pastry and cut it into round pieces of ca. 10cm diameter. Take a piece, put some sauce on top and cover it with another piece. Close the edges with a fork. Cover the top with some butter and sugar.